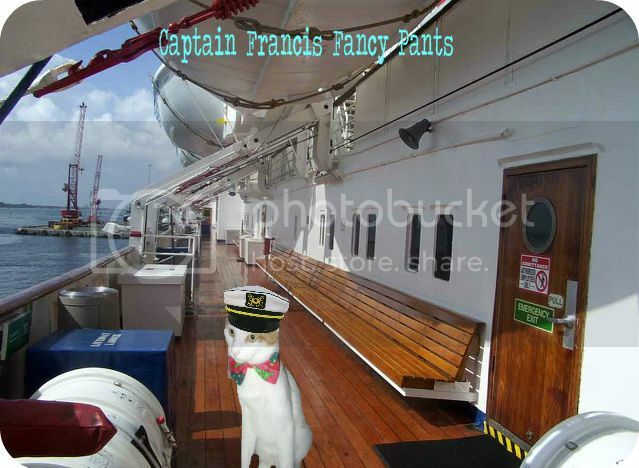 Hi Everyones this is Captain Francis Fancy Pants. I am so honored to be your Captain of the Week! I am having a Grillin Celebration all week! Let's get things started with some foods. Later we will be one the deck to play shuffleboard and volleyball. Last update on May 24, 7:44 am by Francis. WOOHOOO I'm in time for breakfast. Way to go Francis have a pawsome week as Capt. I'm keeping my paws crossed this post will work. Has fun at the grillin Celebration. Congratulations Francis! Way to go !! I hope I'm not too late for some pawsome breakfast. Concats Francis have a pawsome week. Concatulations Francis!! The food looks amazing, thank you! Thank you, Neekah Boo, Smokey Jay, Mac and Bugsy! Hope you all come over to the Grillin Celebration. We will be celebrating all week long, so please stop by and grab some foods and has some funs. Thanks for the Pic Abby! I thinks I looks Cool. Having so much funs, I forgots to put lunch up...so we will just have to do dinner now. After dinner we will have Caturday Night at the Movies. I thinks they showing The Darn Cat and The Cat in the Hat! We will have refreshments at the movies. Popcorn, Peanuts, Candy Apples, Pizza from Winstons Pizzeria too! what a perfect lunch Francis. Thats a great picture of you on deck Captain Francis and look at that cake yummy!! !